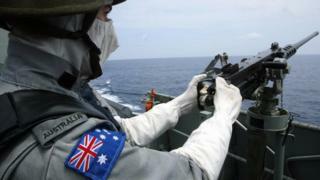 China has responded angrily to Australia's Defence White Paper which outlines a surge in military spending. A boost of A$29.9b ($21.4b, £15.4b) over the next decade reflects concern over military expansion in the region. The white paper reiterates Australia's objection to the reclamation of land in the South China Sea and urges ASEAN and China to agree on a code of conduct. China says it is "seriously concerned" and has expressed its "dissatisfaction" over the defence strategy. Foreign Ministry Spokeswoman Hua Chunying asked Australia to "take realistic actions" to work with China to maintain peace and stability in the region. "In the hopes of relieving tensions and the possibility of an arms race, we hope that relevant countries can give up joint drills and stop increasing their military presence in the region," Ms Chunying said. The largest investment outlined in the White Paper on Thursday is for submarines to replace Australia's current diesel and electric-powered Collins Class vessels. At a cost of more than A$50b it represents Australia's largest-ever defence procurement. About 25% of the additional spending will be put towards the most "comprehensive regeneration of our Navy since the Second World War", the Defence document says. Australia's Prime Minister Malcolm Turnbull said the threats faced by Australia were not limited to foreign conflicts, but also included terrorism, cyber-warfare and climate change. "[This] is a plan to become more powerful on land and in the skies, and more commanding both on the seas and beneath them. It is a program to be more resilient in the cyberspace, to be more innovative with technology, and to have greater situational awareness thanks to our advanced intelligence capabilities," Mr Turnbull said on Thursday.